Technology enables business innovation, transformation and growth. But rapid advancements in technologies also present challenges to IT professionals who must keep apprised of new developments and evaluate the risks and opportunities for their organizations. BraveIT 2018, an event held on September 13 in Chicago, was the first in a series of annual shows designed to help IT professionals make sense of new technologies such as AI and blockchain, cybersecurity, and digital & IT transformation. 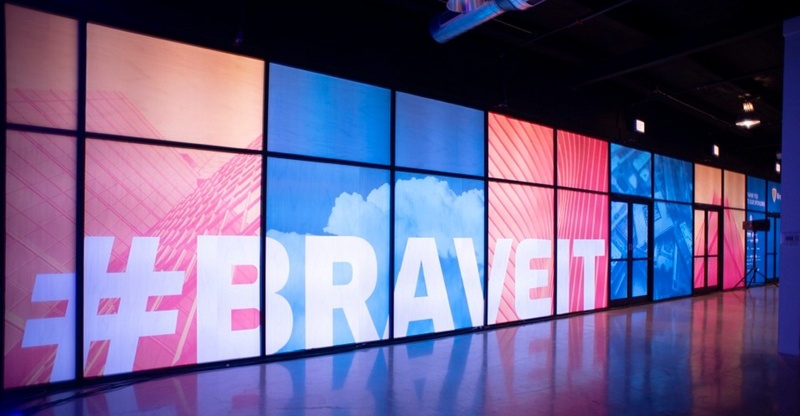 Hosted at the Revel Fulton Market, a revamped former warehouse in the trendy Fulton Market neighborhood, BraveIT 2018 drew hundreds of IT managers, analysts, CIOs, CTOs, engineers and product managers. They shared ideas and advice on IT security, emerging technologies, business continuity and the future of data centers. The half-day event featured panel discussions, workshops, peer-to-peer sessions and talks by top IT executives and analysts from leading organizations such as Forrester, MIT, Microsoft, Radware and VMWare. The emergence of cloud computing as a mainstream IT infrastructure. At the same time, those drivers also create challenges for organizations undertaking a digital and IT transformation. The panelists, IT executives from Enable Midstream Partners, Potbelly and TierPoint, discussed some of the main challenges that they faced with digital transformations at their companies, and how they dealt with those challenges and achieved success. The average organization has between 30 and 50 security products scattered across their enterprise. That can create enormous problems in the management, visibility and control of security. One strategy is to leverage the cybersecurity capabilities already in IT infrastructure, said Wade Holmes, Director of Technical Cloud Product Management for VMware. Holmes explained how using these capabilities can simplify security management and mitigate the risk of cyber-threats. Cyber-attacks have become increasingly sophisticated as hackers continually adapt and upgrade their tactics. Fortunately, IT security providers are leveraging advanced AI and machine-learning as part of their multi-layered defense capabilities. Carl Herberger, Vice President of Security Solutions for Radware and TierPoint’s Chief Security Officer Paul Mazzucco described how cyber-attacks work and how AI can help defeat them. Read more about this session on using AI and Machine learning for cybersecurity. This was the focus of the keynote address by Dr. Daniela Rus, Director of the Computer Science and Artificial Intelligence Laboratory (CSAIL) at the Massachusetts Institute of Technology. Rus, recognized as the world’s leading authority on robotics and AI, explained how AI and machine learning make it possible to create highly sophisticated robotics. She discussed some of the groundbreaking research currently underway in AI and robotics, and shared examples of how these technologies will impact business and IT in the future. The show also featured the first annual BraveIT award for innovative IT contributions to a worthy cause. This year there were two winners. First place went to Joe Wilkinson for his non-profit program, Code the Block, which provides after-school technology classes and summer camps for inner-city high school students in Kansas City. Code the Block offers classes in software engineering, web development and application development. Wilkinson received a trophy and a $10,000 donation to Code the Block. The second-place winner, Bridget Altenburg, is the CEO and founder of another technology training program, Chicago-based National Able Network. It provides training, career coaching and job placement assistance for seniors, military veterans and others wanting to enter the IT profession. She also received a trophy and a $5,000 donation to the Network. There was a lot more that happened at BraveIT. Want to learn more and watch the full sessions? Check out our new BraveIT website. Don’t miss your chance to attend BraveIT 2019. Next September, we will be in New York City for an exciting second annual BraveIT conference. The event will feature IT industry experts discussing a variety of the pressing topics impacting IT. Pre-register to reserve your spot.